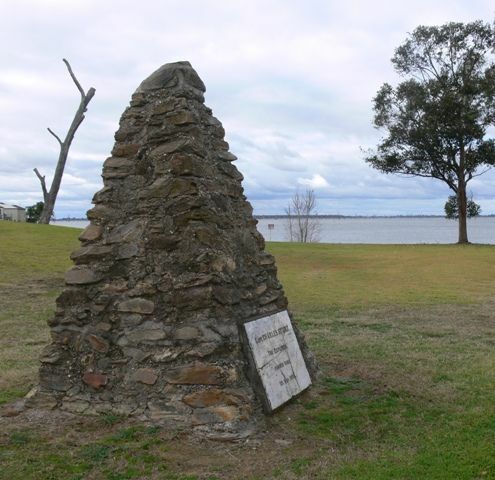 A cairn commemorates explorer Captain Charles Sturt who passed Mulwala on his exploration journey along the Murray in 1838. Residents of the Murray River towns, Yarrawonga in Victoria and Mulwala in New South Wales, joined to commemorate the historic journey along the Murray by the explorer Captain Charles Sturt, in whose honour a memorial cairn, near Mulwala Bridge, was unveiled on Friday by His Excellency the Governor (Lord Somers). Argus (Melbourne), 13 January 1930.